The Oregon Department of Transportation has had many years to figure out a way to justify widening Interstate 5 through the Rose Quarter. As one of the narrowest points in this major interstate that runs from Canada to Mexico, it’s been on their widening list for decades. And now that they’ve finally pieced together the political and funding momentum to do actually it, they’re having trouble explaining why it’s needed. It turns out the public is a lot more skeptical of freeway mega-projects than lawmakers and bureaucrats. A scathing report in the Willamette Week today pokes holes in one ODOT’s major justifications: safety. If you browse over to I5RoseQuarter.org you’ll see graphics and statistics about crashes. But as activists opposing the project have pointed out for months, those crashes are most just low-speed fender-benders that don’t result deaths and injuries. That didn’t stop ODOT official from bringing up two fatalities to City Council during testimony last month. In exchanges with the press, ODOT officials have repeated [ODOT Policy and Development Manager Kelly] Brooks’ line of argument—that the Rose Quarter project is about safety. That’s a particularly compelling argument because Portland City Hall has committed itself to eliminating traffic deaths. “The primary purpose of this project is to address a critical safety need,” emails ODOT spokesman Don Hamilton. 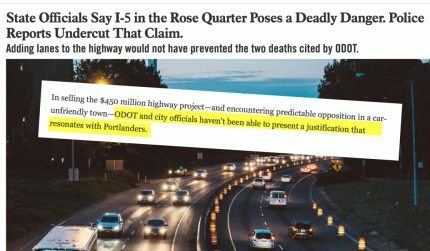 The Willamette Week story comes after Portland economist Joe Cortright — one of ODOT’s biggest critics — offered his own skeptical analysis of ODOT’s safety claims. Other justifications made by ODOT and other supporters of this project, have also failed to hold up to scrutiny. What about congestion relief? Even backers of the project like Mayor Wheeler admit that the project won’t have a major impact on gridlock. It’s been proven over and over again: Adding lanes to freeways has never solved congestion. Then there’s the argument that somehow a freeway expansion project will right the historic wrongs that the construction of I-5 (and destruction of neighborhoods that followed) caused in the first place. 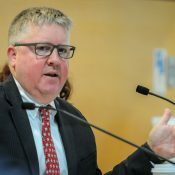 Mayor Wheeler went so far as saying the project, “Restores the very neighborhood that was the most impacted by the development of I-5 and that’s the historic African American Albina community.” (He also claimed that, “people from communities of color” have “testified overwhelmingly in favor” of the project, despite there being no evidence of such testimony.) ODOT has promised their public process will include a, “robust understanding, research and engagement strategy of the historically wronged African-American community and other communities of color.” But these claims are hollow and are nothing but empty promises at this point. Perhaps the estimated $225 million (“half” the total) promised to be spent on surface street improvements for better bicycling, walking and transit is a solid justification for the project? That claim hasn’t won a lot of support either for a variety of reasons. For one, ODOT hasn’t provided any cost breakdowns yet so we can’t know for sure what teh various elements would cost. And even if we did, are these the bike/walk/transit projects the community would prioritize with that much money? It’s a symbol of the power of these mega-projects that so much political momentum can exist with so little justification for the project itself. So far the marketing of this project has been handled by ODOT. Given what’s at stake, I wouldn’t be surprised to see the Portland Bureau of Transportation — a major supporter of the project — step in and assert their local influence with a new PR strategy. 1. they promise to re-connect the grid, but they are removing an important connection (Flint) and adding a new one that is less important. 2. They promise to add park space/openspace but they are just turning over to the City the concrete lids over the highway that will be used for staging. These cannot support any plant life and they are not located in areas that are appropriate for plazas or outdoor spaces for people. The following link is to a pre-I-5, pre-Rose Quarter map of the Albina district. As you can see from this map, there were never any historic east-west connections of any of the following streets in what is now the I-5 ROW: Dixon, Hancock, Tillamook, Thompson, or Page. I-5 never severed these connections and thus there is no such thing as ‘restoring’ them; the bluff was too steep in this area to have ever made these connections in the first place. Adding a Hancock-Dixon connection ‘for cyclists’ is just so much hooey, what they really need to do to maintain historic connectivity is to either save or rebuild the Flint Street bridge. Well, that’s a development goal, and not an active transportation goal, same as the streetcar, and we all know how well that turned out for cyclists. Why is it a bad connection? It would allow you to bypass the most stressful/dangerous section of Broadway. You just cut over right before Larrabee and then go to the bridge. Hanford-Dixon will be lousy for cyclists because of the steep grade and the out of direction travel required. Flint already avoids the worst section of Broadway, because it intersects with Broadway west of the highway interchange. And, if they were concerned about “recreating the grid”, they’d be putting sidewalks on the west side of Vancouver (they’re removing that one) and the west side of Williams, just north of Broadway, to connect to the neighborhood to the north. Instead, they’ve allowed freeway ramps to eliminate those connections. It doesn’t have to be that way. In rebuilding the Vancouver and Williams bridges, they could be shifted over so there’s room between those street lanes and the ramp lanes for a sidewalk to connect to the north crosswalks on Broadway. They’d have to angle the street bridges, so traffic can feed in/out from the streets south of Broadway. But obviously pedestrian connections are not high on their list of priorities. Vancouver as a connection to Broadway rather than Flint, appears as though it will be a very important connection to Broadway. The two north-south bound streets are parallel and right next to each other. Flint is going to be closed at Tillamook, north of Broadway. Removing the Flint-Broadway intersection, likely will help reduce close calls and collisions. 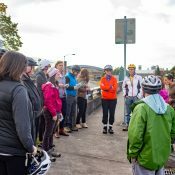 The bikeportland story reporting on the tour of the project area, conducted by ODOT officials, with a rep from the design contractor this past weekend, quoted those people as referring to the construction infrastructure as, not lids, but ‘covers’. Lighter construction than would be required to support buildings. I wrote in comments to that story, that cost estimates for covers that would support buildings, should be asked of ODOT. Might as well think now, of creating something that could be a great improvement over what’s there now. This space would be bette served by buildings with plazas than just large swaths of unprogrammed and unmaintainable openspace. Having buildig sthere would also put more pressure on ODOT to include the sidewalk along Vancouver, maintain the Flint connection and help restore the grid they destroyed with the highway. Currently you cannot turn right onto Broadway from Vancouver, that is a prohibited turn. wsbob, while I agree that asking about the cost of more substantial covers is a good idea, ODOT seems very unlikely to consider it. During the bike tour, being able to have buildings on the covers was also brought up, and ODOT said that the heavier girders necessary would have more impact on the surrounding neighborhood. Emily…I read your report and thought it was good. ODOT is working for us, the people of Oregon. If the people of this state want from the state transportation dept, some options to certain aspects of this project, the dept better at least be prepared to assemble some kind of design some options if they’re requested, and cost estimates for the options. Do the people want options, or are they happy with the project as planned? Basically, living in Beaverton and having lived in this area for a long time, I feel I understand some of the reasons people feel this project is necessary. Economic probably being the biggest of those reasons, but road system functionality being a major associated reason. At the same time, what I’ve been able to gather from ODOT officials’ explanation of the costs of the the basic components of the project: infrastructure for use with motor vehicles, and for walking and biking, and general improved livability, don’t really clearly add up so far. Half of the 450 mil…240 or thereabouts for bike and pedestrian infrastructure? I doubt that amount for bike and pedestrian infrastructure is correct. The transportation dept has to tear down and build new bridges so it can add auxiliary lanes to I-5. The new bridges aren’t being built exclusively for bike and pedestrian use, but also for use with motor vehicles. Use of the bridges for bike and pedestrian use is beneficial, possibly even great, but it’s incidental. Basically then, the part of the project those bridges represent, is general transportation infrastructure rather than bike and pedestrian specific. The people of this state, ODOT and the city ought to be taking a very hard look at something far more substantial and useful than the flimsy, limited use ‘covers’ its’ planning to install over I-5 at the RQ. Sure it would cost more money. Nothing new about that. At least know what the options cost, before plunging forward with some half baked scheme that sounds likely to uglify this part of Portland for generations to come. Solid foundations for a tunnel over this section of I-5 that can support a fine bit of landscaping, at least, and maybe buildings two or three stories high. If the transportation dept isn’t willing to co-operate…no thanks. The money should be used to bring our high crash corridors up to modern safety standards. That’s where the deaths are, and they are due primarily to ODOT negligence. 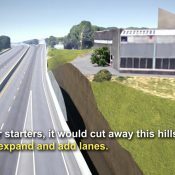 For sure, If they wan’t to cut down on crashes just figure out a way to keep people from switching lanes in, just before and just after the tunnel on highway 26. There are crashes there because of illegal lanes changes on a daily basis. In the RQ project, reducing last minute lane changes are I think, part of the reasoning for the long auxiliary lanes that are planned. These lanes can help keep traffic flowing more smoothly, if not necessarily faster. Smoother flowing traffic with fewer unnecessary lane changes and less stop and go traffic on this stretch of I-5, sounds like it would be a definite improvement over the level of congestion during rush hour on that section of the road now. .
As I’ve written elsewhere, I think the major force for this project, is economic development for the city, hoped for from the RQ. The city has been working on the RQ for decades, gradually adding business and infrastructure. It anticipates a huge number of people traveling to and from Downtown and the RQ. And how will they make that trip? In no small part, by using I-5, which increasingly gets clogged up worse and worse by local traffic. The CRC is a considerably different story. Vancouver factors into that project in a big way, but not to the RQ project. The idea that more freeway lanes lead to economic development is not based on data. Removing freeways from urban cores has resulted economic development on numerous occasions. Examples in N. America alone include Portland, Milwaukee, San Francisco, Niagara Falls, Toronto etc. If you think that adding lanes here will reduce unnecessary lane changes or fix problems caused by late changes, you haven’t observed driver behavior. People see empty lanes and think they can get ahead, only to get to the merge point and cause the slowdown they started in. Exactly. Most of the High Crash Corridors are on state highways (82nd, Powell, etc) that ODOT is responsible for. Rebuild the orphan highways ! Seriously, if you think ODOT is going to bring a megaproject in on time or on budget… Need we be reminded of the Hwy 20 straightening project? It took them a decade, and cost 365 million on a budget of 140 million. Even if I didn’t oppose the project on its merits I wouldn’t want to hand a 450 million dollar budgeted project to ODOT when they have proven they can’t execute on large projects. Oh…well, we got a guy sitting in the chair of the highest office in the land. Maybe he can take the project on and get it done under budget like he claims he did with the ice rink in NYC. Between tweets, should be no problem for him. It’s not hard to justify at all. It’s about reliability. By addressing these minor crashes, it prevents non-recurring congestion, which is the worst kind of congestion. The kind that can lose someone their job, prevent them from picking up their kids, miss a court date, etc. Better to have a predictably long commute than a completely unpredictable one. Plus freight movement depends on reliability above all else, so as not to miss their shipments in critical supply chains. I have no idea why ODOT can’t seem to communicate this relatively simple idea, but there it is. It’s like they’re throwing up their own straw men for people to knock down, rather than just saying clearly what the project is for, like I did just now. Just say it and say it proud, ODOT! It’s not about safety or recurring congestion. It’s about reliability. I think before they have stated it’s about reliability. But there are reasons to oppose that argument as well. Better transit would be reliable, less expensive, safer and more environmentally friendly. And while we’re at it, how did we get to always and predictably become the opposition to OUR state agency, whose salaries we pay?! Bingo. Thanks Jonathan. An excellent piece. I can’t tell you how nice it is to wake up and read “ODOT” and “Struggle” in the same headline, when 99 times out of 100 it seems that it is us who are destined to struggle (over their wrongheadedness). you are correct- this project would greatly improve reliability! That is all it will do. It is not a bike/ped project. It is not a green openspace space project. ODOT and the City are bending over backward to attempt to justify this legitimate improvement because this improvement is not worth the huge price tag, and it does not justify spending this money in lieu of improving genuine safety problems. Even reliability is questionable, because drivers can’t cooperate and merge instead of racing. Congestion pricing would instantly boost reliability and revenue. The only real benefit to touching it at all is seismic resilience, which still doesn’t warrant the price. I could accomplish the stated goals of the this project much cheaper and with better outcomes for cyclists and peds. Lets just put 4 or so 12 foot culverts along this section of I5 with a bit of gravel at the bottem for a roadbed. Then fill around them with dirt up to a level where we can build a decent park on top. There will be no lane switching accidents, and any oversize vehicles that won’t fit can go over the Fremont Bridge and around that way. Cut down on noise too. But this seems like a statement without any facts. Your anecdote may reflect the organized turnout against the project at the public hearing but without any actual scientific polling on the subject it seems like irresponsible reporting to me. Unless (and correct me if I’m wrong) you don’t argue that this site isn’t journalistic by its very nature. Classic “throw everything at the wall and see what sticks” bs. ODOT uses this scattershot approach because it has no real idea on how to fix the problem of congestion but wants to maintain it’a bloated permanent staff. ODOT’s bizzarre priorities and decisions make perfect sense when you realize that the primary incentive for ODOT leadership is to bring in and spend as much money as possible. Their ability to do this keeps state and local elected under their heel. The new bridge at Sellwood is an even more egregious case: a $90 million firm bid turned into a $300 million monstrosity. Sellwood Bridge was the County, not ODOT. What really pegs the BS meter on this thing is ODOT’s claim that nearly half of this project’s costs are for bike, pedestrian and transit improvements. And besides not being remotely factual, ODOT’s claim is only going to increase misguided motorist resentment towards us as taking away money from road projects. Definitely an interesting claim. But then, in the story that Emily Guise wrote up about the tour of the RQ project area last weekend ODOT reps and the contractor rep conducted last weekend, claimed that the bike pedestrian part of the project was only 5-10 percent designed. So maybe the cost estimate at this point, is just a very rough estimate. Doesn’t seem as though anybody yet has actually asked any of the officials, specifically which of the parts of the RQ project for bike, pedestrian and transit, make up the 220 million or so. Seems to me like a good question to be asking. ODOT had the determining oversight on the new Sellwood bridge. Its western approach involves a state highway, and much, if not most, of the excessive cost was due to geotechnical structures to restrain earth movement and permit massive realignment of the road. I testified before the Oregon Transportation Commission on the topic, and Gail Achtermann, then the Chair, cited a staff study that any expense in excess of $80 million would be a waste. Multnomah County had no technical input whatsoever. Their PR chief was running their part of the show. They just rubber-stamped whatever ODOT proposed. ODOT intentionally runs up project costs. I am certain you have been hearing plenty about the myriad benefits of the proposed I-5 expansion through the Rose Quarter.Although this area is fraught with congestion, a half a billion dollars cannot be justified for the convenience improvement project at I-5 through the Rose Quarter. Now that ODOT is backing away from the unjustifiable claim that this is a safety project, please take a minute to scrutinize the so-called “benefits” this project claims to offer. If we want to borrow hundreds of millions of dollars to make safety improvements, please look at where the deaths and serious injuries are happening (Powell Blvd, 82nd Ave, Outer Division, etc). a. This project will build concrete lids over the highway that will be used for staging. After construction, the project gives these concrete lids to the City and calls them “openspace”. These cannot support any plant life and they are not located in areas that are appropriate for plazas or outdoor spaces for people. b. In order to grow trees in this condition, the structure would need to be engineered to support a minimum three-foot depth of saturated soil by approximately 10′ x 10′ per tree plus the live load of mature trees. In addition to the additional structural and drainage requirements, trees, shrubs and groundcovers would ABSOLUTELY NEED permanent irrigation to survive Portland summers; and climate-change projections are for increasingly hotter and longer dry spells. Without being connected to the earth to maintain a minimal level of moisture, these planters would be become bone dry within weeks of no rain, low humidity and temps in the 90’s (typical July, August, September). To keep plants alive, even the most drought-tolerant species would need some water every 2 weeks to maintain soil moisture. There is absolutely not any money in the maintenance budget of ODOT, PBOT, or PP&R for this. Before believing this can be used as any kind of openspace, ask ODOT to provide a detailed agreement of who is paying for ongoing irrigation and maintenance. d. The “lids” exist purely to provide a space to divert traffic so they can keep this busy interchange open while they perform this work. If these stages weren’t needed, the lids would not be part of the project. b. Who would use the Clackamas bike/pedestrian bridge? Williams is a straight shot from the north and Lloyd Boulevard around the back of the Convention Center works from the south. Flint connects the north to the Boradway Bridge, and thei proposed replacement takes people out of direction. The proposed Clackamas Bridge would provide a direct route across I-5 for those who live in Lloyd District, but all they need to do now is take Multnomah under I-5 and they can save the huge climb and steep grades this bridge will require. a. This project proposes no sidewalks on the west side of Vancouver! c. This project proposes to eases the corners with large-radius curbs to accommodate high-speed turns. These endanger pedestrians with longer crossing distances and higher speeds. d. One way to improve walkability is to remove the highway on and off ramps at Broadway-Weidler. These cause the area to be congested with high speed traffic. If they were removed, Broadway and Weidler could get a road diet, and some of the land now being used for ramps could be sold for development. a. The African-America community was devastated by construction I-5 and the Memorial Coliseum. They have subsequently been largely pushed out the area. This project serves freight interests, and developers with a stake in the PPS site, along Broadway-Weidler, or adjacent to the Rose Quarter. If the City wants to invest hundreds of millions to attempt to give back to the African America community what it took away from them, this is neither the place nor the means to do that. a. A cheaper and less intrusive way to achieve this would be to close the Broadway-Weidler Exits (302-A) both north and south bound I-5. This would eliminate a lot of dangerous weaving and free up a lot of space in the Rose Quarter for redevelopment and bike and pedestrian improvements. 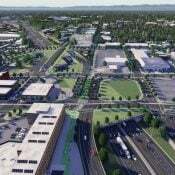 This project would greatly improve reliability for people using the highway through the Rose Quarter, and that is ALL it will do. This is not a bike/ped project. It is not a green openspace space project. This is not an urban design project. ODOT and the City are bending over backward to attempt to justify this legitimate improvement because this improvement is not worth the huge price tag, and it does not justify spending this money in lieu of improving genuine safety problems. The claim is that half of the budget will go to pedestrian and cycling improvements. Do these improvements look like $225 million worth of bike/ped improvements? If the City and State were to spend $225 million on bicycle and pedestrian improvements, is this what they would look like? Would they be located here? Are you having a hard time answering that question? Ask for a cost breakdown and a diagram of what the project will look like without the pedestrian improvements; here’s a preview: the Clackamas Overcrossing is gone and the budget is reduced $25 million tops. There is no pedestrian or cycling benefit in this project that is needed or wanted and there is nothing being included that doesn’t serve the highway project. If/when Leah Treat’s seat opens up, I would support MaxD’s application. I’d be very surprised if the city is able to find any way to take seriously, your suggestion to close the Broadway-Weidler Exits (302-A) either north or south bound I-5, or the I-84 exits, if that was on your mind also as as means to reduce conflicts for highway users. The project is designed to facilitate better access with less conflict to the RQ by way of I-5. Opponents of this project can’t expect to successfully propose ideas to cut out access to the RQ by way of I-5, unless they somehow are able to come up with viable alternative ideas to meet the travel needs of people using I-5 to access the RQ. I think you meant to say “in their car, alone” at the end there. “needs” indeed.